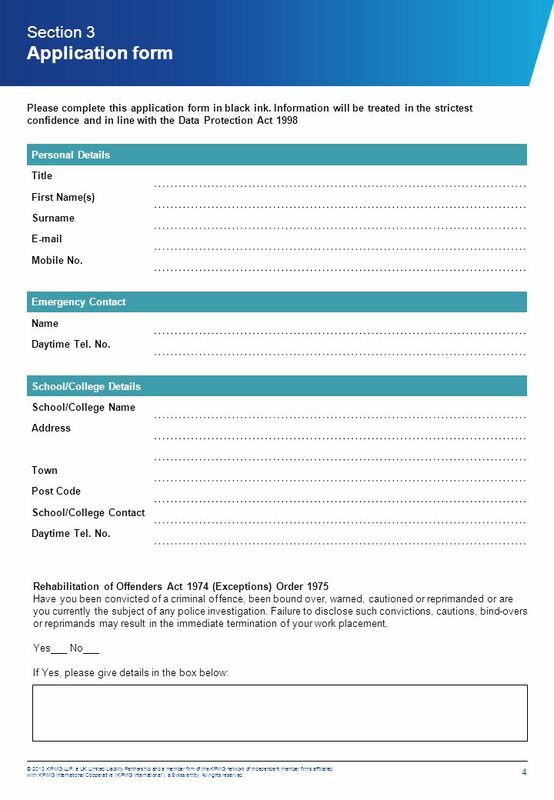 2013 Work Experience Application Form. 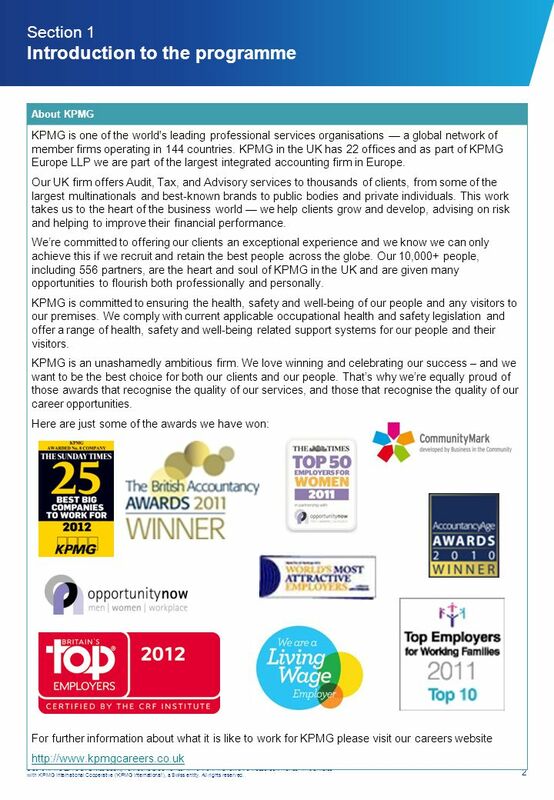 1 © 2013 KPMG LLP, a UK Limited Liability Partnership and a member firm of the KPMG network of independent member. 4 3 © 2013 KPMG LLP, a UK Limited Liability Partnership and a member firm of the KPMG network of independent member firms affiliated with KPMG International Cooperative (‘KPMG International’), a Swiss entity. All rights reserved. 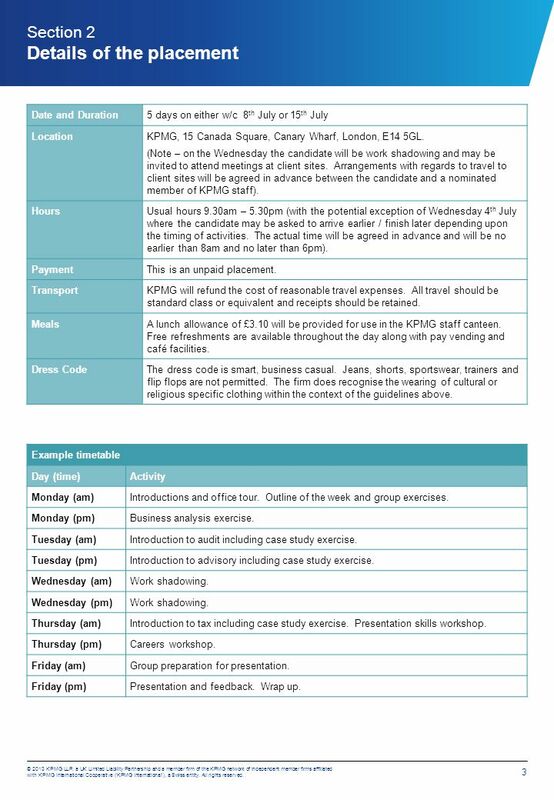 Section 2 Details of the placement Date and Duration5 days on either w/c 8 th July or 15 th July LocationKPMG, 15 Canada Square, Canary Wharf, London, E14 5GL. (Note – on the Wednesday the candidate will be work shadowing and may be invited to attend meetings at client sites. Arrangements with regards to travel to client sites will be agreed in advance between the candidate and a nominated member of KPMG staff). HoursUsual hours 9.30am – 5.30pm (with the potential exception of Wednesday 4 th July where the candidate may be asked to arrive earlier / finish later depending upon the timing of activities. The actual time will be agreed in advance and will be no earlier than 8am and no later than 6pm). PaymentThis is an unpaid placement. TransportKPMG will refund the cost of reasonable travel expenses. All travel should be standard class or equivalent and receipts should be retained. MealsA lunch allowance of £3.10 will be provided for use in the KPMG staff canteen. Free refreshments are available throughout the day along with pay vending and café facilities. Dress CodeThe dress code is smart, business casual. Jeans, shorts, sportswear, trainers and flip flops are not permitted. The firm does recognise the wearing of cultural or religious specific clothing within the context of the guidelines above. 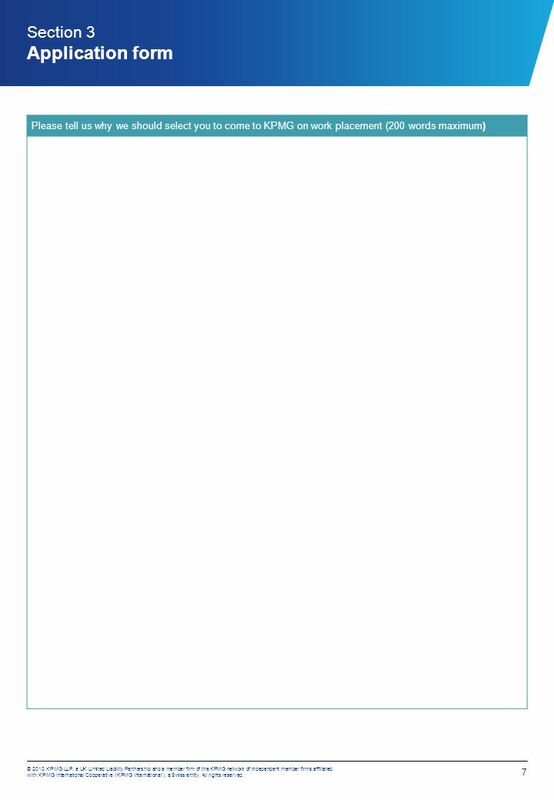 Example timetable Day (time)Activity Monday (am)Introductions and office tour. 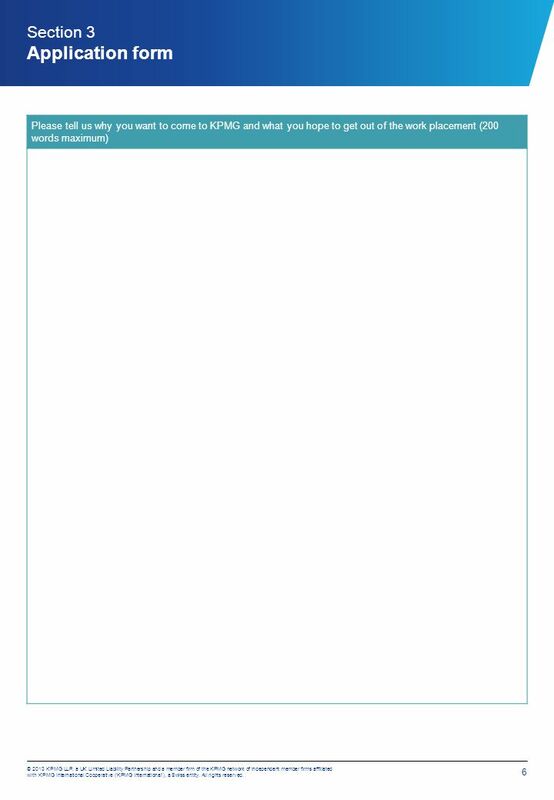 Outline of the week and group exercises. Monday (pm)Business analysis exercise. Tuesday (am)Introduction to audit including case study exercise. Tuesday (pm)Introduction to advisory including case study exercise. Wednesday (am)Work shadowing. Wednesday (pm)Work shadowing. Thursday (am)Introduction to tax including case study exercise. Presentation skills workshop. Thursday (pm)Careers workshop. Friday (am)Group preparation for presentation. Friday (pm)Presentation and feedback. Wrap up. 10 © 2013 KPMG LLP, a UK Limited Liability Partnership and a member firm of the KPMG network of independent member firms affiliated with KPMG International Cooperative (KPMG International), a Swiss entity. All rights reserved. 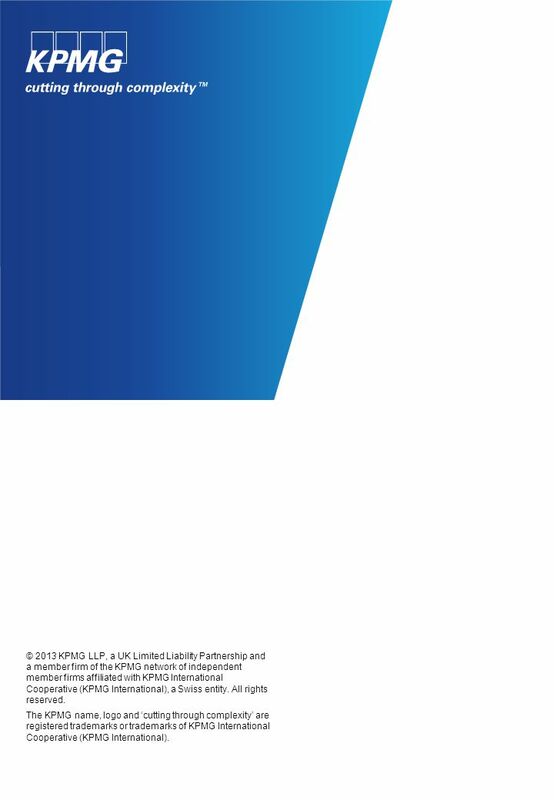 The KPMG name, logo and ‘cutting through complexity’ are registered trademarks or trademarks of KPMG International Cooperative (KPMG International). 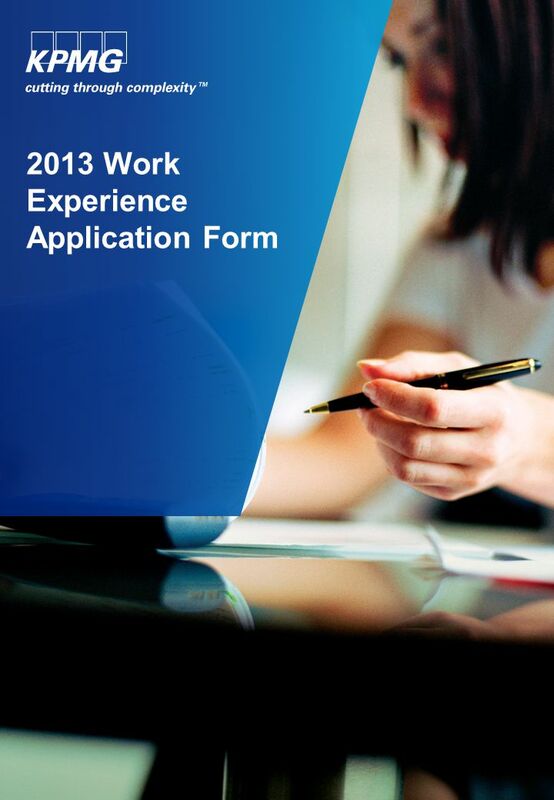 Download ppt "2013 Work Experience Application Form. 1 © 2013 KPMG LLP, a UK Limited Liability Partnership and a member firm of the KPMG network of independent member." Emotional First Aid Dear Emotional First Aider, We are pleased to announce that your Train the Trainers’ course will take place on 10 th and 17 th March. Supporting & promoting Equality & Diversity through REF Dianne Berry, Chair REF E&D Advisory Panel Ellen Pugh, Senior Policy Officer ECU. Su Coombes – Teaching and Learning Consultant (Equalities) Equalities in Bristol Schools. 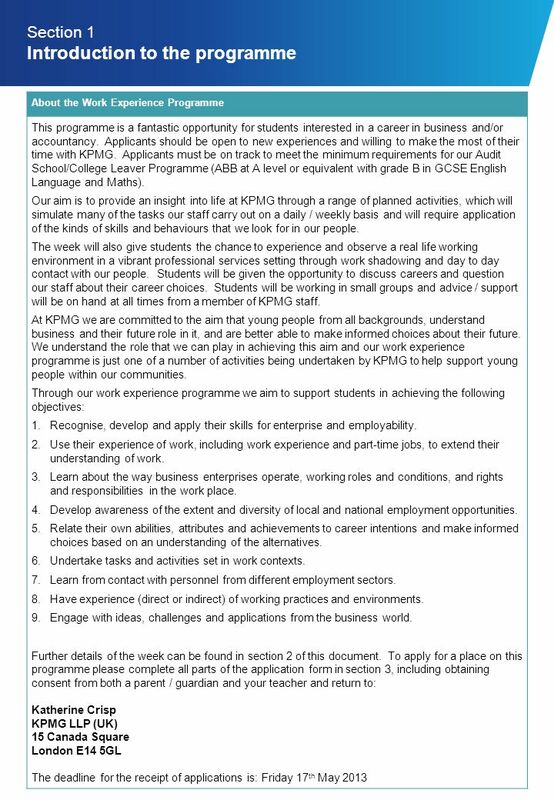 Work Experience 2016 Monday 11 th – Friday 22 nd April. 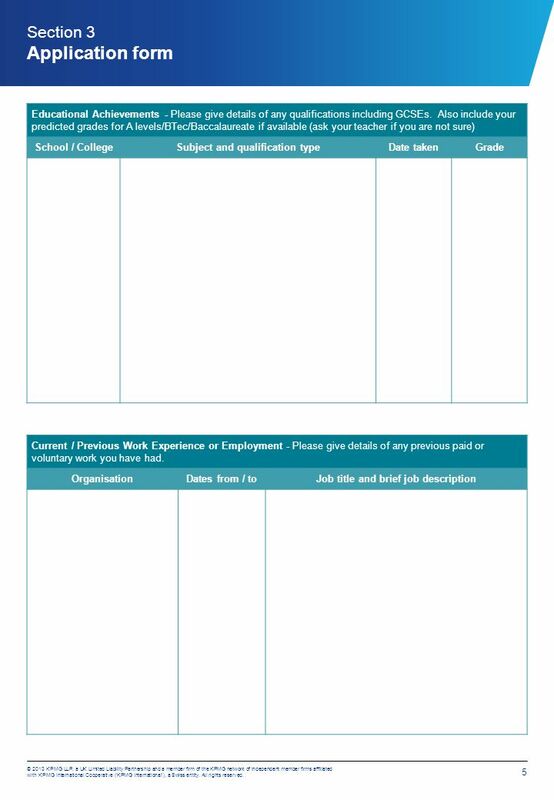 1 A Guide to Work Experience – Questions & Answers The Guide HCS works with the majority of the secondary schools within Hertfordshire to support the co-ordination. WORK EXPERIENCE INDEPENDENT PLACEMENTS. Who are we? We are an independent charity that has been organising work related learning activity since 1993 We.